Scottia Moccatta, one of the world's largest precious metals bullion dealers, shows on their website as of this morning that they have run out of all silver bars available. Yesterday the US Mint posted their silver sales for the month of January at 6,472,000 ounces. This was 50% higher than any recorded month in history! Physical inventory is being purged from the system at an alarming rate. 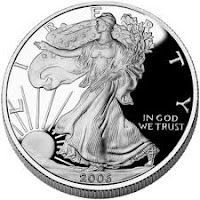 By the time the average American realizes what is being done to their paper money, there will likely be no physical silver available to purchase. In other news, the head of the Kansas City branch of the Federal Reserve said yesterday, "The Federal Reserve could debate extending its bond-buying program beyond June if U.S. economic data prove weaker than policymakers expect. Another round of bond buying "may get discussed" if the numbers look "disappointing,"